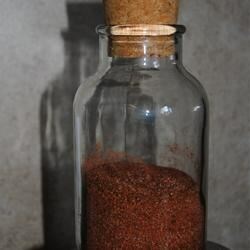 "This rub adds flavor to any meat cooked with any method! You can use just black pepper instead of the blend if you wish." Stir the paprika, pepper, brown sugar, chili powder, onion powder, sea salt, and cayenne pepper together in a container with a lid. Store in a cool, dark place between uses. Flavor is so subtle it is pointless. A little sweet, a little heat, a lot of flavor. We loved this! It was delicious on chicken so we tried sprinkling it over burgers on the grill. That was fantastic, too. I can't wait to try it on ribs. This is really good on fish, but I did not like it on my chicken or red meat.